I had time to play the FTTC30 today. The challenge was to use pearls on our cards. This one was quick and simple, and done with scraps from my stash. I pulled out a piece of magenta cardstock and stamped the floral images with Versafine Onyx Black, embossed them with clear ep, and cut them out. I popped them up on foam tape and added some black pearls to the centers. The top panel is a piece of dsp (name unknown) that I've had forever, and I matted it with a piece of matching magenta cardstock. I scored 3 lines underneath the panel, but they didn't photograph too well, perhaps you'll see them if you click on the picture. The ribbon is white grosgrain from my stash. The sentiment is from the Upsy Daisy set, and I colored it with markers and then stamped it. I'm glad I got time to join in the challenge today since I missed the last 2 weeks! Thanks for stopping by and thanks for a great challenge! Oh my word, this is AWESOME! Love that plaid paper!! Wow, this is a classy, classy card! Oh my Carol, this card is so pretty! I love how you did those flowers and that plaid paper is to die for! LOVE IT!! This is wonderful, Carol!!! 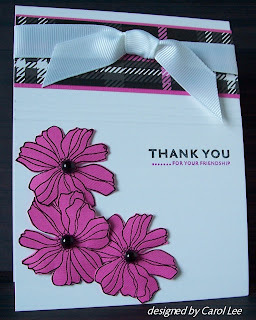 Great layout, cut work detailing with the flowers, and I just love the colors and plaid paper. Great pearl accenting!!! Thanks so much for playing FTTC!! !